I had to make this chicken hat to go with my chicken apron as I've decided to wear the whole poultrylicious ensemble on Halloween! 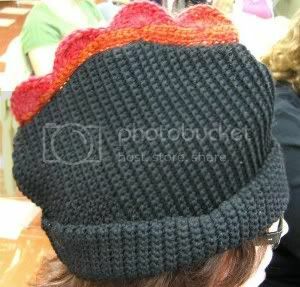 And yes, that is me modeling the hat as my fellow SNB-er, Ellen, snapped the pic while I was crocheting...yes, poultry. Are you sensing a theme in my work as of late??? I know, I really need to make a veggie...But can you all give me a round of applause for making not one, but two functional items in one month!!! Would anyone be interested in making a chicken hat? If so, I will write up the pattern. Speaking of patterns and THE TESTERS...Eyeball Pattern Testers please send me your feedback as soon as humanly possible. Thank you for helping me out! Lady, how much would you charge to crochet an all black beanie? I'm kinda shoppin around. You know, that chicken hat would be just enough for me to wear at work and drive my boss up the wall. Plus like yourself, I have an affinity for chickens. I would love a pattern if you do produce one. 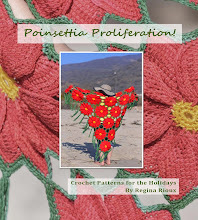 You definitely have a very KOOL crafty site, I love the Crochet Monster, you are a hoot. Love the poultry accessory. Yes, you must have a pic of you all done up in chicken-wear. Mmm-kay? Say......while wearing your chicken hat are you allowed to hen peck your old man? You so gotta make some big honking yellow chicken feet house slipper thingies......and I am STILL awaiting my maggots! I'd love to test the pattern, it's fantastic! Hi! I came here from someone else's blog.